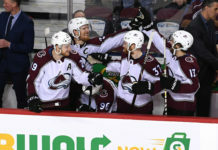 The Colorado Avalanche ended a two-game skid with an overtime victory over the Philadelphia Flyers on New Years Eve in Denver. 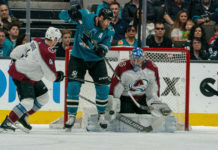 Jarome Iginla tied the game late and Ryan O’Reilly provided the heroics by scoring the game-winning goal with just 19.9 seconds remaining in overtime period. O’Reilly now sits fourth all-time in Avalanche (14-15-6) history with five regular season overtime goals. The clutch 23-year-old also has an overtime goal in the playoffs. The Flyers rallied to turn a one-goal deficit into a 3-2 lead in the third period, but the Avs showed some resiliency and found a way to force overtime and then pick up two points. The two teams spilt their season series, with the Flyers (14-16-6) taking the first leg with a 4-3 win on Nov. 8. With the loss, the Flyers have now lost three-straight games as they head into the New Year. Rookie forward Borna Rendulic scored his first career NHL goal in his fourth game with the Avalanche. He was recalled from the Lake Erie Monsters on Tuesday. The Flyers started the scoring with a power play goal at 10:14 of the opening frame. Jacub Voracek one-time a shot from the right faceoff dot that beat Varlamov high-glove. The Flyers went 2-for-5 on the power play on the night. Nate Guenin scored his first goal of the seasons and fourth of his career to tie the game midway through the second stanza. Just under four minutes later, Rendulic one-timed a shot from the slot to put the Avs up 2-1. The 22-year-old Croatian started the game on the fourth line, but moved up to a line with O’Reilly and Gabriel Landeskog before his first career goal. Vincent Lecavalier and Claude Giroux scored in third period to give the Flyers a 3-2 lead. Giroux walked through all four Avalanche penalty killers before firing a shot past Varlamov to take the lead. Jarome Iginla provided the big goal that has escaped the Avalanche for much of this season and tied the game with just over seven minutes left on the clock. Tyson Barrie made a spectacular feed and a great play to set up O’Reilly’s overtime game-winner. He circled the Flyers’ zone before sending a backhand pass across the slot for O”Reilly to one-time past Steve Mason. The Avalanche continue their homestand on Friday, when the Edmonton Oilers come to the Pepsi Center.